Dragon Arums are one of those plants that make you say, “wow, that is beautiful but there’s no way I can grow that!”. I am here to tell you that Yes you can! When in bloom, these things are simply amazing! They look like something straight out of an exotic botanical garden. So now for the million dollar question, how the heck do you grow these things? Surely they need tons of special care and/or growing techniques right? The answer is absolutely not! The two images you see here is the one growing in my yard purchased from Store welcomemybylove on Etsy. The key to growing Dragon Arums is patience, patience and more patience. The first think you should know is that these like many bulbs, have a short growing season. They grow for about 2-3 months out of the year and flower for only about a week. So the first thing note is that this will be more of an oddity in your garden , be it a beautiful one. This is where patience comes into play, given their short growth cycles, don’t expect to plant this in the fall and have it flower in the spring because chances are it ain’t goan happen, unless you are very lucky! These bulbs need a lot of energy to produce their magnificent flower. What happens when you plant is that they can take up to TWO growing seasons to recover before producing their first flower or foliage for that matter. So if for example you plant in the fall, don’t expect to see anything the first spring. You might even think they are long dead because chances are you won’t even get any foliage the first go round. So it’s best to set it and forget it . Now don’t completely forget about them so that you end up planting over them because you will be rewarded with growth their second spring. Their growing season begins in late winter here in Zone 7. You will first notice the stalk growing in late February early March. You may have even forgotten all about it so don’t mistake it for a weed! The stalk then proceeds to grow for about 1 to 1.5 months when it then starts to produce a very distinctive growth from the base. This will become the wonderful flower you’ve been waiting for. The bloom takes about a month or so to become fully developed. By mid May, the flower begins to open up. After a couple of days, the glorious flower you’ve been waiting for is ready! Now you don’t want to be away on vacation or anything when this happens because the flower will only be around for a week or so. 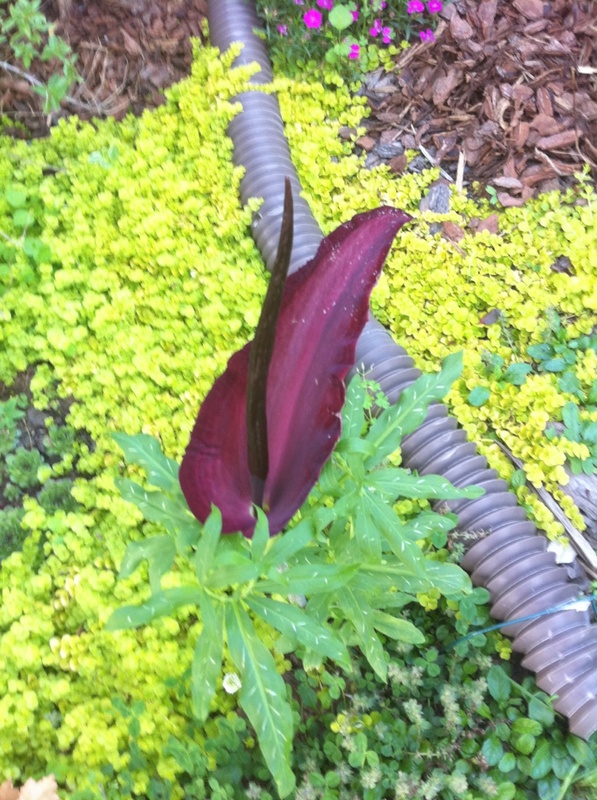 That’s what happened to me its first growing season, so in my case it took almost 3 years from planting until I first saw my first Dragon Arum flower in full glory! Remember, patience is key here. Purchase these from Direct Gardening or the like. Don’t expect to find these bulbs at Home Depot. Now that you know what to expect, here is how you plant them. First, they will need a partial shade spot. They will grow in full sun but you may not get a flower because the foliage will not last long in full sun. Second, the hole needs to be deep, much deeper than a regular bulb. They will require a 6″-8″ hole with maybe the same in diameter as the bulb is larger side. Another thing to note is that they will be difficult to transplant once established. The bulb seems to burrow deeper and you may have a hard time digging deep enough to get it out so pick your spot wisely. Much is made about the rotting flesh odor though you really need to get up close to smell it so it should not be a concern planting by a door. Their odor is strongest for only about 1 or 2 days anyhow. They don’t seem to be particular about soil, an average soil will work fine. Add a bit of nice garden soil to the hole in full clay situations. The bulb looks like a round fat disc so you may have a hard time identifying which way is down on the bulb. This will be the flat smooth side. The top of the bulb will not be as smooth. If in doubt, plant sideways. Cover the bulb, again, you may want to amend a little with good soil. Now comes the hard part, wait and wait and wait! This bulb has strictly vertical growth. The stalk grows straight up and spreads out a bit though not much. The flower emerges from the base of the plant once the stalk gets to about 2 feet. The flower may add another 6″ to 12″ of height for a total of maybe 3 feet. After a few growing seasons you may get offshoots. These are not invasive in anyway. Once growing, these will require no care on your part. Just wait and watch the amazing showing every spring. You can water them along with neighboring plants or none at all. Since they grow in the spring, mother nature will probably provide all the water they need. The stalk will persist for another few weeks after the bloom fades. It will proceed to die back to the ground once summer comes along at which time you can forget about it until the following spring. Foliage Color: Attractive, tropical looking. Attractive tiger stripped stalk. Watering: Average to None, let mother nature provide.